The September 14 New York Times print edition contains a full-page ad from the Gary Johnson-Bill Weld presidential campaign, subtitled, “An Open Letter to the Commission on Presidential Debates.” It points out that polls show 62% of the public want the Libertarian ticket in the debates. This entry was posted in Libertarian Party and tagged ad, Ballot Access News, Campaign ad, Gary Johnson, Libertarian Party, New York Times, newspaper, Richard Winger on September 14, 2016 by Krzysztof Lesiak. September 13, 2013 – Darrell Castle discusses Vladimir Putin’s op-ed that was published in the New York Times on Wednesday, September 11, 2013. Castle was the Constitution Party’s 2008 vice-presidential candidate. This entry was posted in Constitution Party and tagged Castle Report, Constitution Party, Darrell Castle, New York Times, Russia, Vladimir Putin on September 14, 2013 by Krzysztof Lesiak. This entry was posted in Constitution Party and tagged Conservative Caucus, Constitution Party, Howard Phillips, New York Times, obituary on April 24, 2013 by Krzysztof Lesiak. This entry was posted in Independents and tagged americans elect, Angus King, Eliot Cutler, New York Times on May 9, 2012 by Trent Hill. Over at the New York Times blog, The Caucus, Gary Johnson has been interviewed and delivers some key messages on the future of his candidacy. He also states how he feels about his nomination chances. Q. How confident are you that you will get the Libertarian Party nomination for president? This entry was posted in Libertarian Party and tagged Bob Barr, Gary Johnson, Libertarian Party, New York Times, The Caucus blog on May 2, 2012 by Trent Hill. 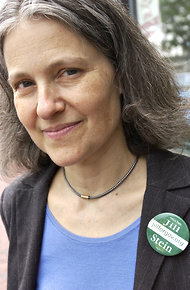 Green Party presidential candidate Jill Stein was interviewed by the New York Times today, for their blog The Caucus. The full interview can be read here. Q. Why are you running for president? Michael Manning/Associated PressJill Stein, a Green Party candidate for president, during her campaign for governor of Massachusetts in 2002. This entry was posted in Green Party and tagged interview, Jill Stein, New York Times, the caucus on February 14, 2012 by Ross Levin. Every week the New York Times prints one letter under the heading “Invitation to a Dialogue,” and then prints responses to it in the Sunday paper. This week, the letter is calling for a “centrist” third party in America. Any interested readers should write in to the Times. A centrist third party could prosper in today’s political environment and end the stalemate in Washington. This entry was posted in Third parties, general and tagged letter, New York Times on December 28, 2011 by Ross Levin. Dr. Panagopoulos described the protesters as “disgruntled Democrats.” Sixty percent of those surveyed said they voted for Barack Obama in 2008, and about three-quarters now disapprove of Mr. This entry was posted in Green Party and tagged disgruntled democrats, Dr. Panagopoulos, New York, New York Times, new york times blog, Occupy protestors, Occupy Wall Street, survey, the caucus on October 28, 2011 by paulie. The Socialist Party U.S.A. does distribute red cards to members willing to “subscribe to the principles” of the party, but another leftist group, the Democratic Socialists of America, prefers online registration, with members using a virtual shopping cart to pay yearly dues of about $60 by credit card — Marx be damned. This entry was posted in Third parties, general and tagged Communist Party USA, Democratic Socialists of America, New York, New York Times, Socialist Party USA on May 24, 2011 by Ross Levin. I’m a Clinton White House alum who had hoped President Obama could usher in the debate we need. It’s hardly all his fault that we’re not there, but I’m convinced the parties’ interest groups and “thought police” make real progress impossible without a new force that shakes things up. This entry was posted in Non-left/right parties and tagged 2012, 2012 election, 2012 elections, 2012 presidential race, americans elect, americans elect corporation, Bill Clinton, Bloomberg, centrist, centrist party, centrists, corporate media, corporations, donald trump, Duopoly, economy, Election 2012, fiscal conservative, independent candidate for president, irregular times, mainstream media, Mayor Bloomberg, media, Michael Bloomberg, new third party, New York Times, Presidency, President, President 2012, President of the US, presidential candidates, Presidential Election, Presidential Race, tea party, Third Party, third party and independent daily, Thomas Friedman, unity '08, Unity '12, Unity12, Washington Post, White House on November 11, 2010 by paulie.